This week it's the Masculine "Anything Goes" Challenge at the Watercooler Wednesday Challenge. I'm really enjoying having a masculine challenge in our line-up as it gives me the chance to make up a stash of cards that are perfect to send to the men in my life. 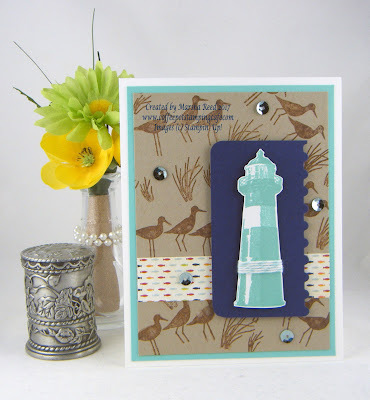 Today I've used the High Tide stamp set by Stampin' Up! I stamped the sandpipers and grass on a layer of Crumb Cake cardstock using Tim Holtz's Vintage Photo Oxide ink by Ranger. I do like that lighthouse image. For all the challenge details and to share your project, visit the Watercooler Wednesday Challenge by clicking the image below. We'd love to have you join us. You have until Monday, 24th at 6:00 p.m. Central Time to link your project. Love the colours you've used for this card. The High Tide works beautifully for both the background and that wonderful Lighthouse image in the foreground. Thanks, Heidi! I'm so glad I have the High Tide stamp set. Another great card using High Tide. It's fast becoming one of my favourite sets. I like how you created the bird background and by popping up the layers and lighthouse in the two shades of blue, you've really made the lighthouse pop out. Thanks for sharing. Thanks, Penny! Love this stamp set. It has so many possibilities. Fiona, you really should do that. It's a great stamp set.